"I was actually afraid and I asked manong driver to rush going out of the place immediately." So what about these ruins? For view seekers and sunset chasers, this is not the place for you! It is absolutely not! Because if you try to figure out, what's very beautiful to see in these mossy old ruined structures? A beautiful background for wedding photos? A perfect background for jump shots? Nah! I will not recommend it because for sure it is not for you! But for heritage conservation advocates, history freaks, researchers and ghost hunters (Uh? Yes ghost hunters), this place I am going to feature today is the right place for you. 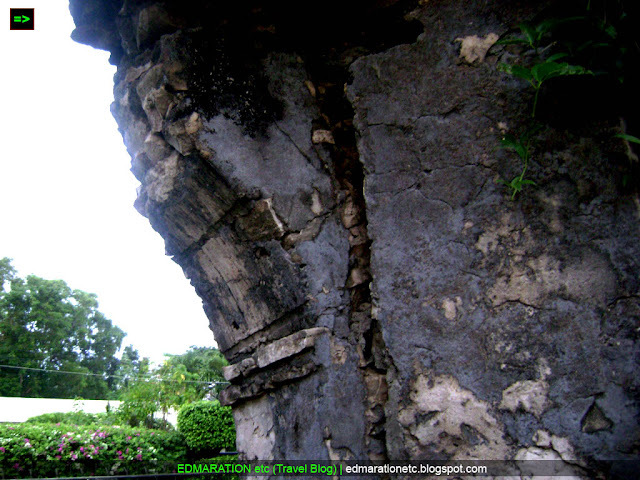 It is called the Pindangan Ruins located in the city of San Fernando, La Union. Ok, before proceeding to the ghost finale, there must be always an introduction and let us start with the etiology of Pindangan. The word Pindangan is an Ilocano term for "a place where meat is sun-dried with salt for preservation." Because this place is abundant with this Pindang, the place was called Pindangan. 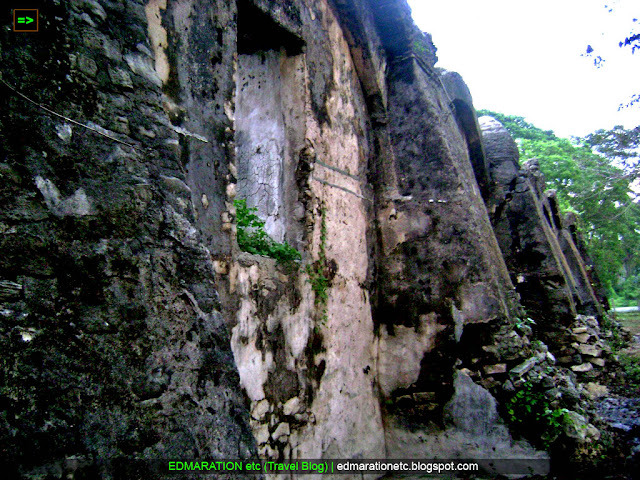 Pindangan Ruins is the remnant of an old church built in May 6, 1786. That old church was the symbol of the union of 2 (two) sitios called San Vicente de Balanac, a coastal village and San Guillermo de Dalangdang, a village at the foothills of the mountain. There was a need for union for the reason of mutual protection against their assailants, the pirates and even headhunters. 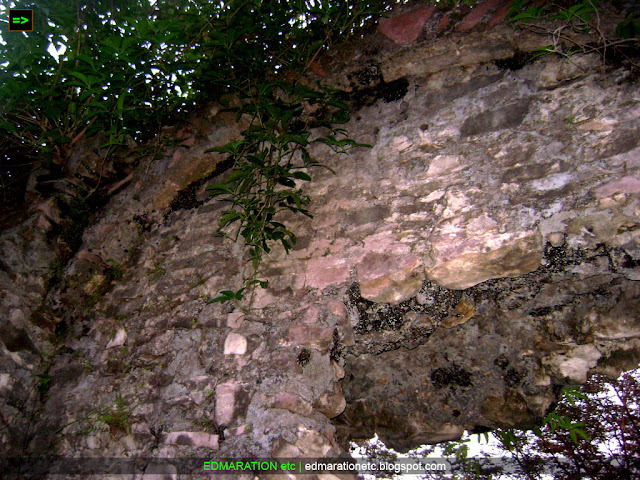 At the present day, the ruins is located in Brgy Parian. Now, the reason why I am here is to see the ruins without expecting to see a panoramic view, lels! Pindangan Ruins is located outside the central business district of the city and I reached this place through hiring a tricycle driver that toured me around the city. As I entered the premises, it was quiet and the sound of the tricycle I was riding was considerably a noise pollution in the area. I told manong driver to turn off the tricycle engine as we are approaching the place because there was a service going on inside the monastery called Carmelite Monastery and the noise of the tricycle is such a disturbance to the solemnity of the activity. There were nuns quietly sitting at the elongated wooden chair in uniform as a priest is delivering his sermon and I can see them inside while keeping my eyes directed to the glass window. At the ruins, the only remaining structures are the walls that used to confine the faith of people into one religious structure for unity and harmony. Now, it remains to be just walls and the ceiling which I believe to have amazing architectural design is long gone. If the Old Daraga Church was destroyed by the Mayon Volcano, this old church in San Fernando, La Union was demolished by an earthquake. So could you just imagine how destructive that earthquake was that it has made this church now into a ruin and that the people in this place no longer restored it. It was in 1892 that the church was destroyed and that was 133 years after it's completion. The church has united the community for more than a century into one house of worship until the earthquake came. The old walls were just the remaining witnesses of the how this church played its role to the people. It was about to go dark when I visited this place at about 5:45 in the afternoon. As I entered the ruined structure the rays of the sun are no longer enough to provide light in the area and it was quite darker to note. The tricycle driver stayed outside and I entered the area alone. I was just enjoying capturing the walls and doing a self-capture to myself but as I set the timer of my camera in flash mode, surprisingly, the camera didn't flash. I repeat the procedure and still put on the flash but it didn't work again until for the third time, the flash worked. As I left the ruins and about to ride to the tricycle, manong driver told me that people in the place are actually afraid of entering the ruins because they have been seeing unusual things there - a priest without a head (they call it pugot in Ilocano) and the priest carries his head with his hands and a nun dressed in white that also appear inside the ruins. Whooahhh!!! Goosebumps instantly! Could that be the reason why my camera flash didn't work? I was actually afraid and I asked manong driver to rush going out of the place immediately. I am personally not so afraid of ghosts (ok, not so, meaning I can still be afraid anytime), but with manong's story, it blew my mind away that gave me adrenaline rush. 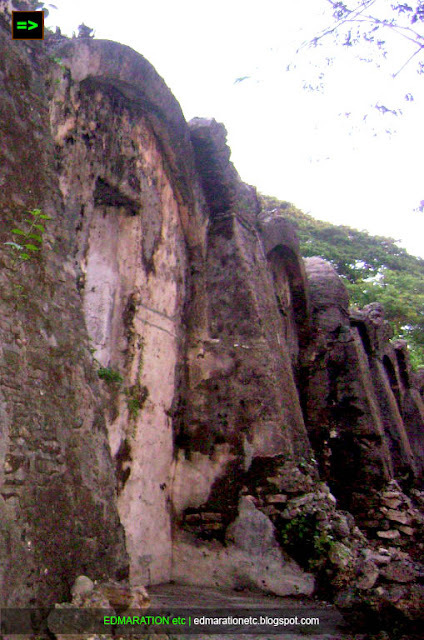 Important things to know about Pindangan Ruins. 1. 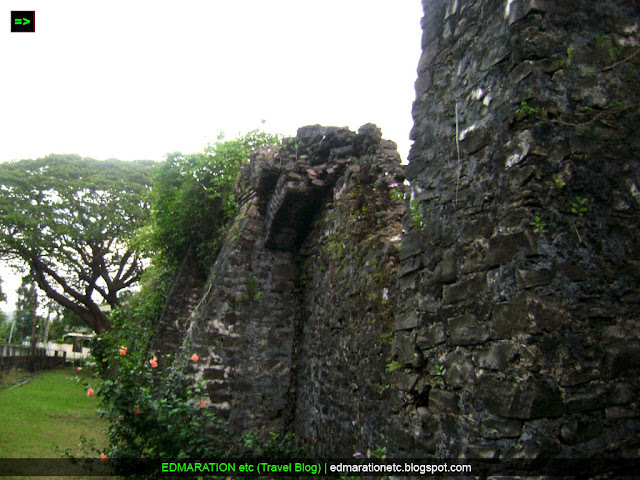 Pindangan Ruins is located 500 meters from the National Highway. 2. Pindagan Ruins is just near Camp Oscar Florendo, the Regional Headquarters of the Philippine National Police (PNP), just in case you are lost in your direction. 3. The Carmelite Sisters, whose monastery is situated behind the ruins take care of the landmark. 4. For people with third eye, please do come here and email me immediately whenever you see the priest and the nun for verification, lol! Haha! Go Enzo and I'll just be around handling a bottle of water just in case you need it hahaah! another great travel post. I love these kind of places. Mysteries, ghost hunting and stuffs but I am a scared cat myself haha..
wow, may ruins din sa la union. pero natakot naman ko sa kwento ni manong driver. @michi, sinabi mo pa. Sana hindi nalang sinabi ni manong para happy ending pero nagmistulang horror ang finale eh hehe. @Paliiiits, sabi ko na nga ba we have diverse likes.. I'm glad you love ghost stories to at least balance this post should I have written it downward. hehe. Eeek! Bakit ba kapag merong mga ruins, laging merong ghost stories? Natakot ako sa kwento ni manong. Tsk.. I'm afraid of ghosts pa naman. 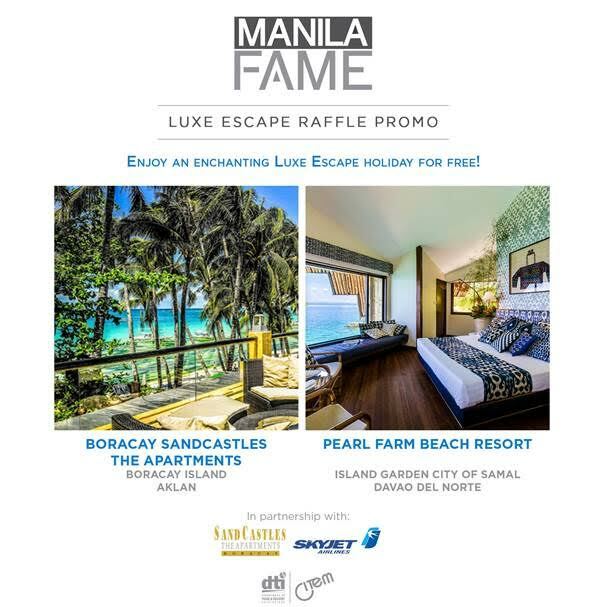 Hindi ko keri to.. Though I love having some adrenaline rush once in a while, gusto ko yung sa mga trek/travel adventures.. not ghost-hunting adventures.. eek! As I see your pictures in this blog, I feel something eerie. As I keep on reading your blog, nothing strange I feel. Then I take a second look of the pictures. Here goes again the ghostly feelings I have had felt. Really the place is strange, the ruins are so haunted. After you've visited the ruins, did you sleep well? Nothing has bothering you? @LEah... oo nga eh and I only learned about it after I am done seeing the place. @Sir Gil, so far, I never felt anything strange after it. Maybe because I was so stressed going home that I waited until 8pm waiting for an empty bus. It was Friday and all buses were fully-loaded and students are going home for a weekend. As in unahan talaga sa bus and the the bus I rode on to was also overcrowded and we are 3 in our seat. Yet, because I wan tired, I managed to sleep in spite of the situation and I didn't care what the person beside me might be feeling or talking that time hahaha. When the back sits were empty, I laid down the dirty couch and slept very well. haha. Awww, good thing I didn't insist to my friend that we go there when we were in La Union last year. I'm afraid of ghosts, & I don't want to see one. Buti na lang talaga...hehe! I feel eerie reading your blog,lumalaki ang ulo ko,and that was strange.I had this ghostly feeling especially when your camera flash did not work.I was hoping na sana nagpakita sa iyo ang taong Pugot just to know your reaction,hehehe. @Tess! Waaah!!!!! Epic 'yun lalo na kapag nag-appear sa photo. Ibebenta ko 'yun. Wahahaa! @Aileen. Haha.. fear goes with the emotion. In fact I was excited to be here when I didn't know abou the story but when manong told it to me, there you are! Goooooosebumps! @Sionee, (kindlehearts), Ang rami kong tawa hahaha!!! I don't believe in ghosts. Never did. But I believe in visiting interesting places like Pindangan Ruins. Great share, man! common story sa mga provinces ang pari na may ulong pugot and white ladies... maybe because it's an effective way of folks there to easily keep their children in their houses during night fall. LOL. Yahweh bless. those stone walls surely spell some great history and memories. i hope the ruins will be preserved all the more for the future generations. Alam mo nangyari saken yan sa Corregidor. Yung tour guide namen kalog, dinala niya kami sa bawal p[agdalhan ng tourists. Yung old hospital ng mga soldiers dati. They declared it unsafe for people to explore and sabi nga nila haunted. When I turned my camera ON to take a few shots, nasira ang cam ko. As in di ko nagamit. Di ko alam bakit eh di ko naman nabagsak. Hay.. I am so not fond of ruins, old churches, etc. Just not the kind of places I am drawn to, but I know that it's a big thing for history buffs, etc. 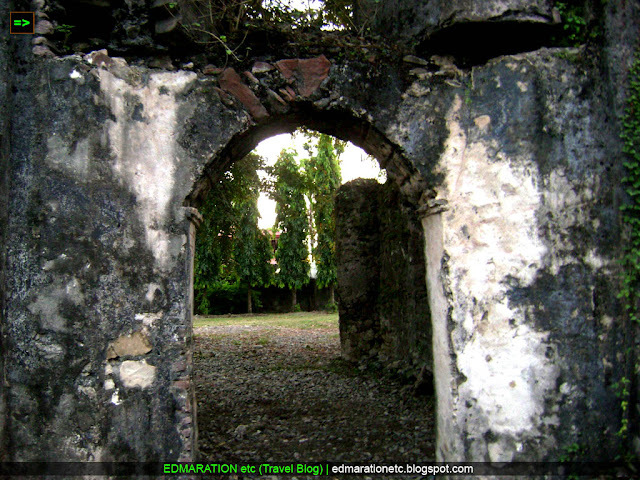 Pindangan Ruins look like the perfect setting for a Pinoy horror movie! first time to hear about this place. what kind of pinoy am I, right?! but then again, i haven't really traveled the philippines extensively. and i envy you coz you travel off-beaten destinations versus those of us who opt for the tried and tested. Ruins scare me and after reading you review it scared me more. I think I'll have a few sleepless nights thinking about that "pugot na ulo". Huhu..
Great post! I like the suspense and twist at the end. 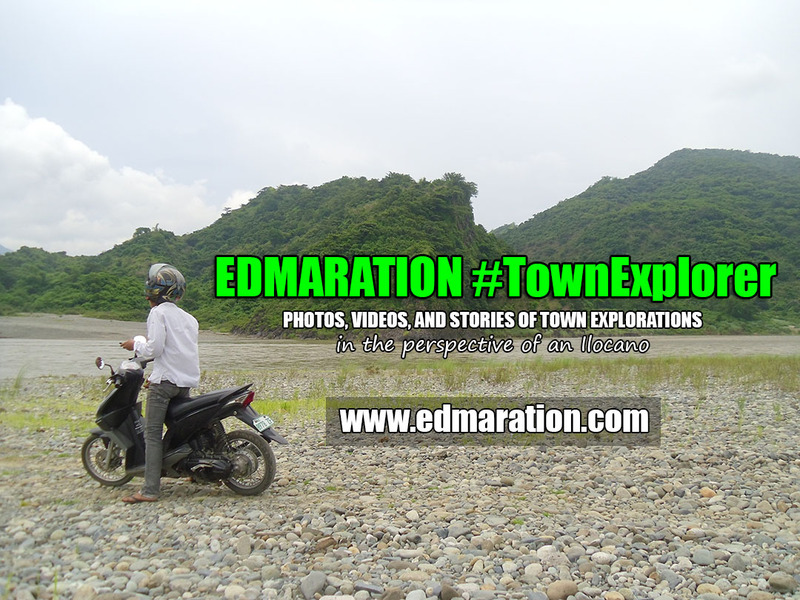 Also, like the others have said, the manong driver was indeed very considerate, not to "ruin" the fun of your adventure by telling the story before you were able to do your explorations. 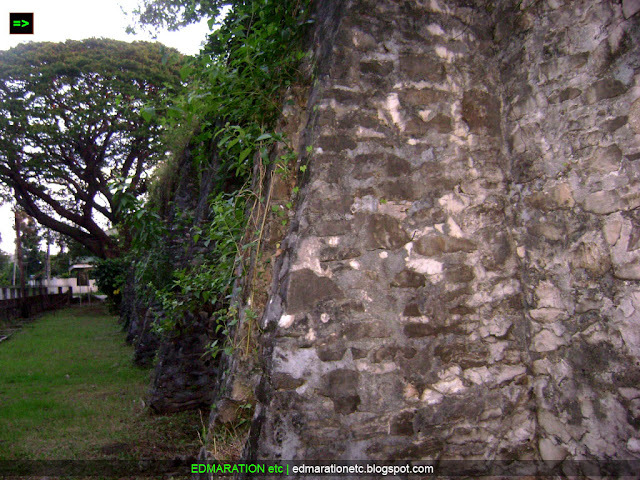 BTW, you made me miss Intramuros. I studied with the ruins of it's wall for four years, and through the years heard a lot of stories of supposed to be apparitions from ghost of the past but never actually experienced them. wow! That was exciting trip! Hahaha I would love to go there one day. :)Happy anniversary! Keep blogging! Good luck to the ghost hunters. I won't be visiting there as I am so scared of the ghost and their related. hohoho! This is my 2nd attempt at posting a comment. Yesterday, for some reason, my comment was lost after I clicked publish. @AJ, hmmmmmmmm.. maybe there's a bug in blogger platform.